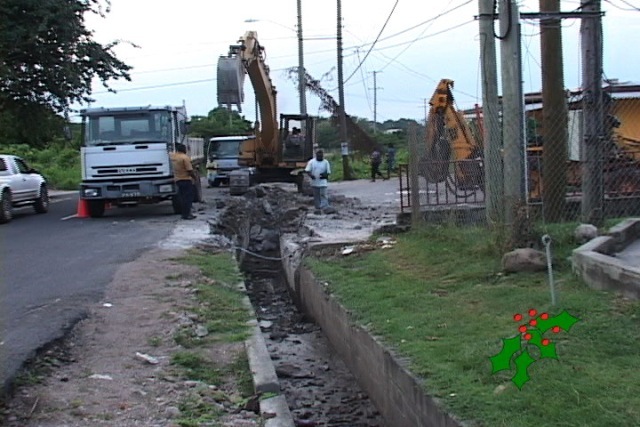 NIA-CHARLESTOWN, NEVIS (December 24TH, 2010) — With the recent repairs done on the Prospect area of the island’s main road, the Public Works Department within the Ministry of Communication and Works has begun repairs on another area. Motorists travelling in the Marion Heights area will soon see the end product of roadwork there. In an onsite interview with the Department of Information yesterday [Dec. 23], Supervisor of Works Mr. Anthony Nisbett said his department had been focusing on making adjustments to the culvert, just outside Newman’s Roundabout Bakery. “[As a result of] the last heavy rain, the culvert was blocked in October and we were concentrating on other areas. We had some round cylinders in the original culvert so we are removing the round cylinders and after we are finished we are going to rehabilitate or refurbish the original culvert and put some covers back on the top,” Mr. Nisbett said. Following the heavy rains in October that led to severe road damage, repairs have been done on a number of roads including Brown Pasture and Prospect.